As diagnosis and treatments for breast cancer improve, more and more women are surviving their diagnosis – and surviving longer. Approximately 90 percent of those diagnosed with breast cancer now survive five years after diagnosis. Decades of research have resulted in clear recommendations for reducing the risk of many cancers, including breast cancer. There is less research focusing on lifestyle’s impact on survivorship, yet it is a fast-growing area of study. 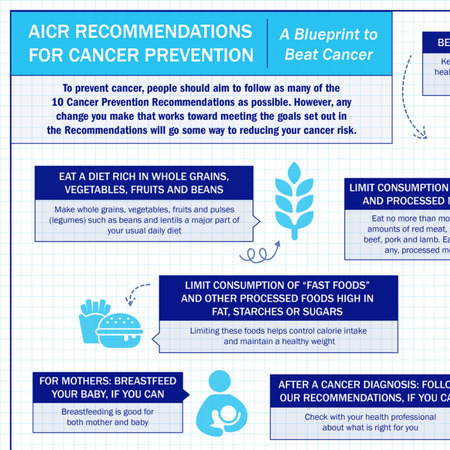 The findings of AICR's latest report on breast cancer survivorship continue to support our recommendation: eating a plant-based diet, maintaining a healthy weight, and getting regular physical activity remain the best strategies for cancer survivors. Get monthly research updates and news on lifestyle and cancer survivorship in our newsletter. Fat tissue is metabolically active; it produces proteins that cause inflammation, which can also promote cancerous changes in cells and tissues. Overweight or obesity increases blood levels of insulin, estrogen and other hormones that can encourage the growth of cancerous cells. Being Physically Active: Some evidence indicates that people who are physically active (both before and after diagnosis) have a greater chance of surviving breast cancer. There are several possible reasons for this, and more research is needed to investigate this link. For example, previous research has shown that being active can help regulate blood hormone levels in ways associated with lower risk. Fiber - In some studies, people who eat more foods containing fiber (both before and after diagnosis) have a lower risk of dying from breast cancer. Soy - Some evidence suggests that breast cancer survivors who eat more foods containing soy have a lower risk of dying from the disease. Dietary Fat - There are indications that people who consume a diet high in fat and saturated fat before developing the disease may have an increased risk of dying following a diagnosis of breast cancer. After treatment, AICR research finds that cancer survivors follow our recommendations for cancer prevention when and if you are able to do so. These recommendations also reduce the risk of other chronic diseases like diabetes and heart disease. 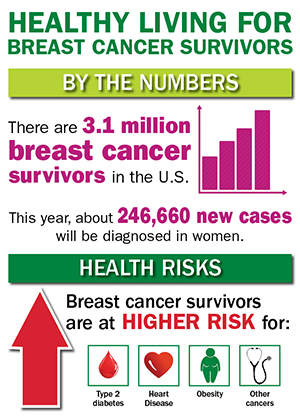 That's important because many breast cancer survivors face an increased risk of cardiovascular disease. Throughout your treatment, and after it's over, you will face many everyday questions. AICR can help. AICR's CancerResource: A Program for Those Living with Cancer is a free toolkit of information specifically for the newly diagnosed cancer patient. Developed with an Advisory Committee of experts, AICR CancerResource's offers worksheets and guidance on eating and being active both during and after treatment.